Home & Garden, Health & Beauty, Furniture, Chairs, Chair, Bedroom, Lounger, Recliner, recliners. We have exclusive rights to this chair for all of Canada, it retails up to $8,000.00 MSRP in stores and is $5,500.00 USA funds in the USA about $7,000.00 Canadian. (If you would like to try this chair let us know and we will find the closest location to you). Picked up at the nearest Day and Ross terminal is only $99.00, home curb delivery only $149.00. - An incredible under foot, heel & toes roller massage, even a unique airbag above the toes to enhance the roller massage. - Above the heel massage, leg extension. Seat, hip, shoulder, bicep, forearm, hand/fingers and both sides of the back air massage. - Incredible 3D massage that is both vertical and horizontal massage, back, calf/knee heat therapy. - Incredible waist stretch function where your shoulders and legs are held, the chair then auto reclines to stretch your waist and lower back. Incredible feature for sure, there is also a back stretch and waist twist feature. - An incredible base of head, side of neck and top of shoulders massage that is and unique to most chairs out there, this is only possible with the 4.7 inch 3D massage rollers extension not available on other massage chairs. - Built in speakers to work with your iPhone, iPod, iPad gadgets. 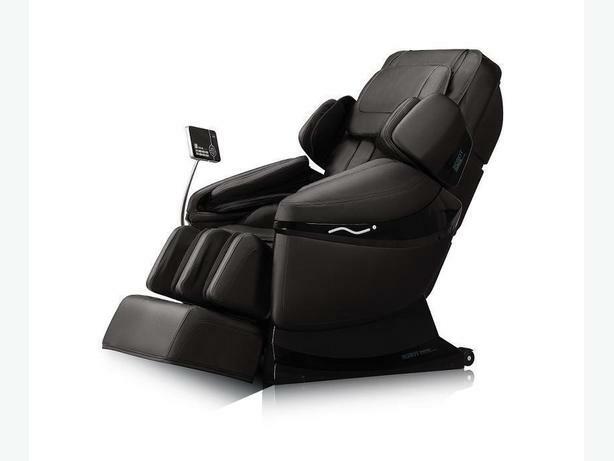 This is an incredible massage chair you only need to try and you will see. We did the Home & Garden & Design Shows and this was a huge hit, we beat out all others at the show with quality of massage & prices by far. If you want to see a comparison chart to the top models out there just ask. !!! A WARRANTY LIKE NO OTHER !! !